Nelson Carter 1900 in a Fegan Immigration Party. 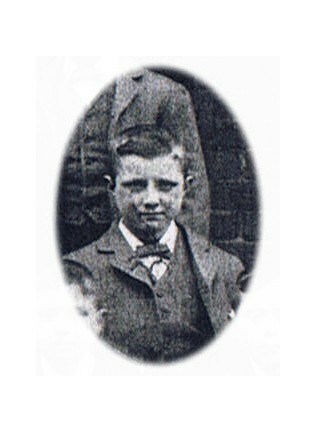 When my Great-Great Uncle John Nelson Carter was sent to Canada from England as an indentured worker by Fegan’s Home for Boys in 1900 I wonder if he realized he would have to make the journey across the ocean once again 15 years later. John Nelson Carter who went by Nelson was a strapping young boy of 12 when he followed his half-brothers Thomas and William Carter across the pond to Canada. 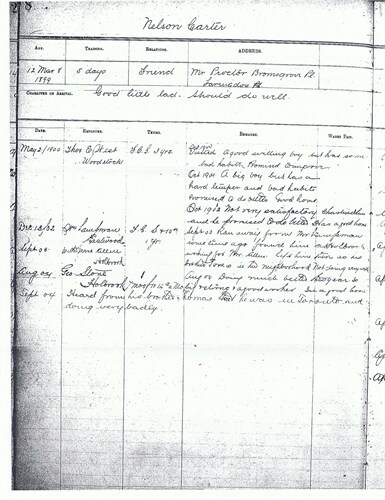 All three had been sent as British Home Children to work as farm labourers here after the hanging of their father John Carter for murder (if you read my blog regularly you will have read about their fathers crimes previously). Nelson had a difficult time adjusting! He was said to be a “good little lad” when he set off from England but during visitations by home child inspectors from 1900 to 1903 his employers complained of his “bad habits”, “hard temper”, and his “unsatisfactory” performance. He eventually ran away from his second employer and was found living next to his brother Thomas’ employer. He was left there in the hopes that he would improve in his brother’s company and he had. But in September of 1904 the hoe visitor reports: “Heard from his [Nelson’s] brother Thomas that he was in Toronto and doing very badly”. What that could mean exactly is left up to one’s imagination. It was at this point that the trail ran cold! Where had Nelson gone? I knew from my previous research endeavours that many British Home Children fought in World War I. Thomas Carter, my Great-Grandfather had enlisted, though he was sent home after training on a medical discharge as unfit for service. I decided this would be a good place to find Nelson and sure enough I did find a Frederick Nelson Carter with the same birth date as John Nelson and the same home town in England. Not only was I assured by another seasoned researcher that this was in all likelihood my uncle but that innate sixth-sense once again jarred me, I felt it settle in my gut, this was my Nelson. 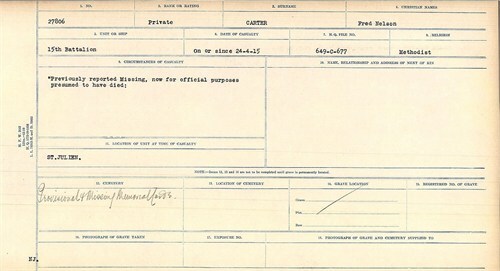 He enlisted 20 September 1914. He was living at 139 Bay St. N, Hamilton, Ontario. His next of kin, a Miss Mabel Ryan, has remained a mystery to me. His papers indicated that he had previously been a member of the 48th Highlanders Regiment out of Toronto for three years. Perhaps this military discipline had helped rehabilitate him and improve his character. Maybe he was able to find a sense of belonging. I wrote to the 48th Highlanders’ Museum to discover he enlisted at age 19, April 22,1907, he was discharged February 28, 1910. A new leaf, a new name, a new job (listed as a printer), perhaps a new girl…but then a new war! 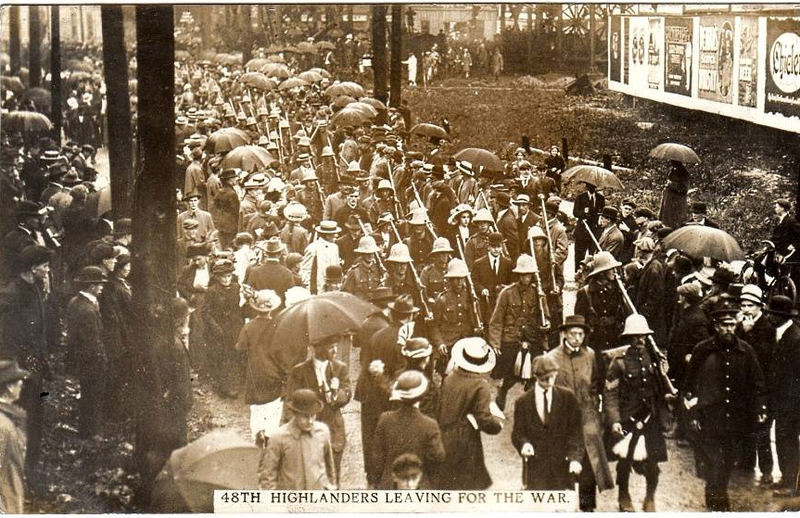 As part of the CEF’s 15th Battalion, along with his former 48th Highlander regiment, his was a short war. They embarked for Britain six days after Fred Nelson’s enlistment, the 26 September 1914 and arrived in France 15 February 1915. Fighting with the 3rd Infantry Brigade, 1st Canadian Division in France and Flanders the 15th Battalion, 22nd of April, battle for control of the Belgian town of Ypres. The Second Battle of Ypres began in the village of Graventafel. The German’s released their first mass gas attack, a 6.5 km yellow and green cloud of chlorine gas choked and blinded yet the 1st Canadian Division held fast the eastern flank, urinating on cloths, holding them to their faces to counter the fatal gases. Surrounded by men dropping, their breath deserting them, Nelson Carter persevered. Lungs burning, possibly one of the walking dead, dying a slow and agonizing death he did not fall . 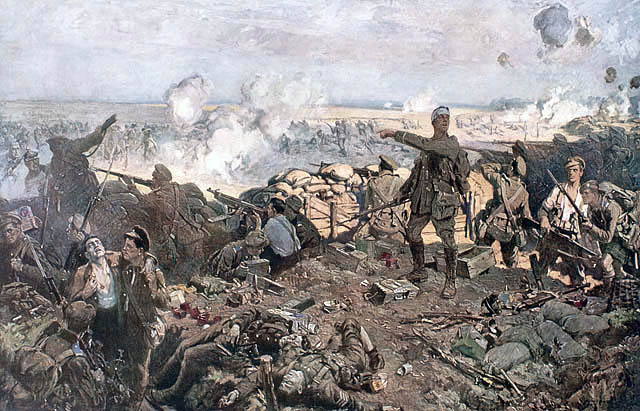 Second Battle of Ypres, 22 April to May 1915 by Richard Jack (1866–1952). Two days later, the front line pushed back as far as the village of St. Julien, the battle continued. Joined now by the machine gun detachment of the 13th Battalion CEF the Germans were held at bay by machine-gun action until again the horror of a new release of poisonous gas filled the morning air on the 24th of April. Again the Canadians–no gas masks which were a later development–once again attempted to oppose the effects of the fumes with urine soaked handkerchiefs. They failed to hold St. Julien and Nelson failed to survive. Confusion ensued , missing in action on the 24th or since Frederick Nelson Carter was gone. Service Card. Missing In Action then Presumed Dead. Memorialized on Menin Gate and in the Canadian Commemorative Book for WWI, Frederick (John) Nelson Carter is remembered! The 15th Battalion CEF Memorial Project, is now aiding in preserving the memory of all the soldiers of this proud Battalion. Working through a vast collection of photos, documents, and artifacts this is an amazing project and I am hopeful that one day they will find a service photo of Nelson Carter among the stacks! Name inscribed on Mennin Gate.